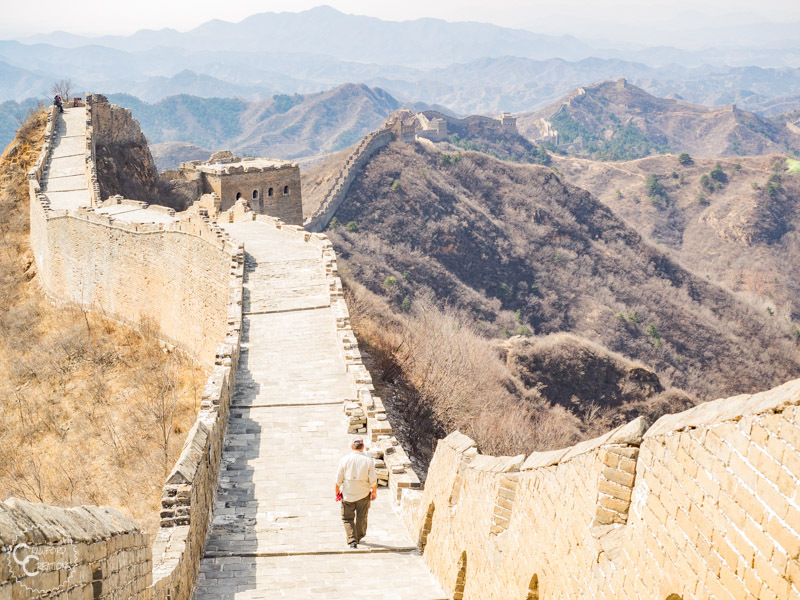 The Great Wall of China is an absolute must-see attraction for anyone traveling to Beijing. It’s not only an iconic and historical symbol of China, but it’s also just stunningly beautiful and really dang cool to see. And Jinshanling is touted as one of the most beautiful sections in all 6000 kilometers of the wall. That’s quite the title. And with something so beautiful within a day trips reach of Beijing, you know I wouldn’t miss it. 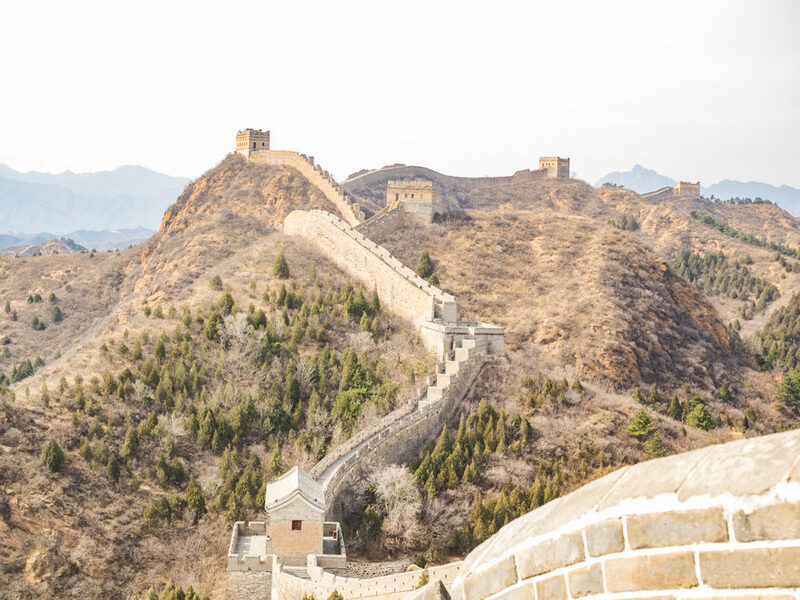 The Jinshanling Great Wall is also supposed to be the best section of the wall for hiking due to the conditions and terrain of the wall itself which are just Goldilocks perfect, the picturesque surrounding scenery, and sparse crowds. Not having been to any other section of the Great Wall in Beijing, I can’t really compare whether those statements are true based on other sections, but I can say that there were indeed stunning views, hardly any people, and great rolling terrain for hiking. 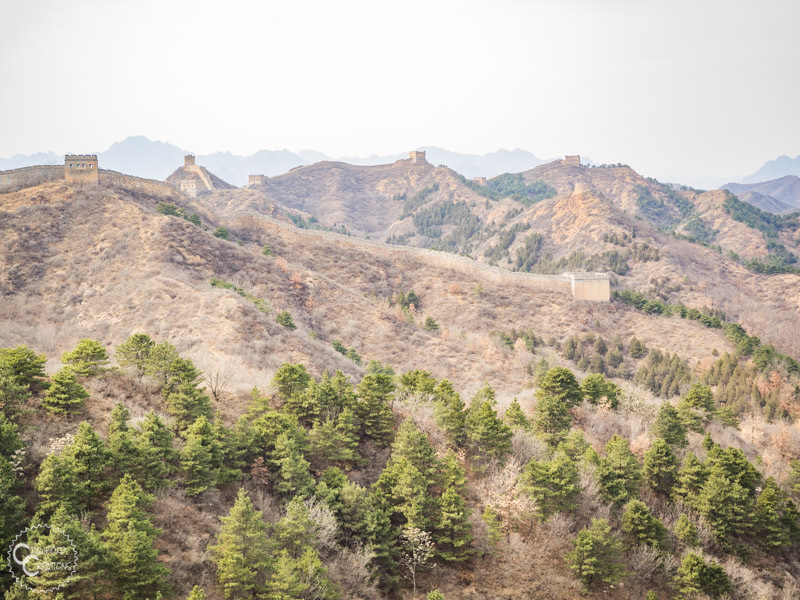 The Jinshanling Great Wall is unique not just in the fact that it’s beautiful and crowd-free, but also due to the fact that it is half restored, and half wild. This section of the wall was originally built starting in 1368 and was restored in 1567. It then sat undisturbed until a final preservation was performed in the 80’s during China’s tourist boom and final opening to the world. 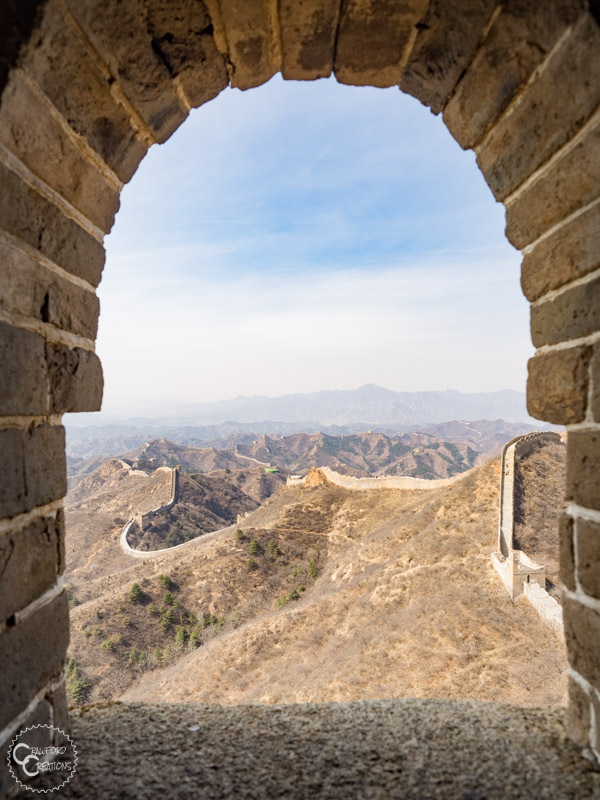 The Jinshanling Section of the wall stretches for 10.5 kilometers along the rolling ridgeline of the Jinshanling Mountains. Dispersed throughout the wall are a series of 67 watchtowers of varying designs. 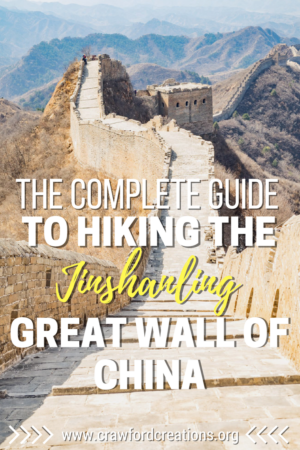 Hiking the entire length of the Jinshanling Great Wall will take you over 5 mountains passes (don’t worry they’re easy enough that anyone in reasonable shape can walk it) with views of the wall and surrounding mountains as far as the eye can see. You won’t believe you woke up that day in one of the largest cities in the world as there’s not a building in sight in the Jinshanling Mountains. Why Visit the Jinshanling Great Wall? For one thing, it’s one of the only sections of the wall where you can see both restored and wild parts in the same place. It also has the most abundant and distinctive watchtowers of all the Great Wall sections, including some that are three stories tall and look like they have little houses on top. If that hasn’t convinced you it’s also got some of the best scenery with the least amount of people, which, I don’t know about you, but that’s a winning combo in my book. Where Is the Jinshanling Great Wall? The Jinshanling section of the Great Wall is located 130 km northeast of Beijing. Jinshanling is located directly between the wild Gubeikou and Simatai sections. How Long Does It Take To Get To The Jinshanling Great Wall? 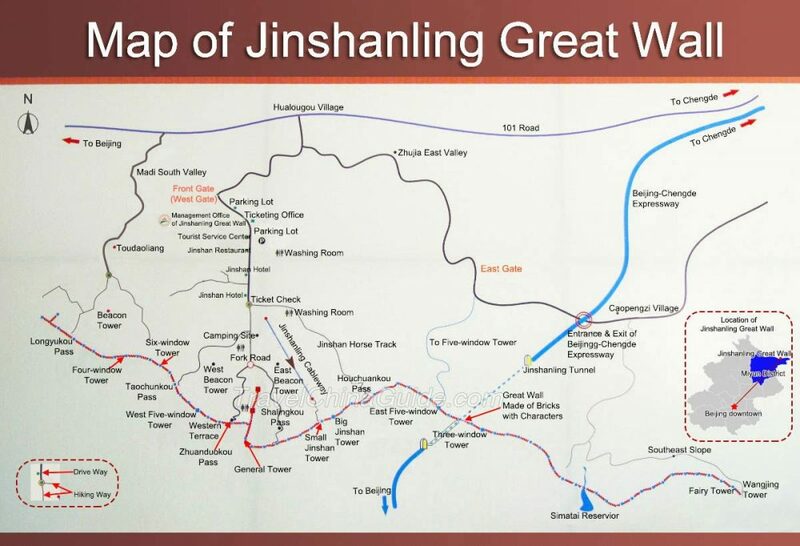 It takes around 2 hours to get to Jinshanling. The best way to get to Jinshanling is to take a car. However, hiring a driver is also obscenely expensive, especially if you’re a solo traveler. The cheapest I could find a driver for was 900 RMB for the day. This wasn’t as big of a deal for me when I went because I split the cost of the car with family, but as a solo traveler I would definitely be seeking out other options. The easiest way to do this is to have the staff at your hotel arrange a driver for you. If you know a bit of Chinese or have a Chinese friend that can help you, you can also arrange a driver through the app Wechat. This is admittedly a bit complicated your first go around so you’ll probably need some help, but as long as you know how to use Wechat and Wechat Wallet and can have somebody help you with the initial set up you’ll be good to go. It’s only 50-100 RMB cheaper to arrange a car through Wechat, so you’re probably better off just asking at your hotel. I found our driver through a recommendation from a friend. He charged 900 RMB for the day to go to Jinshanling and back whereas my hotel charged 1000 RMB. A direct bus to Jinshanling is only available during peak season from April – November. 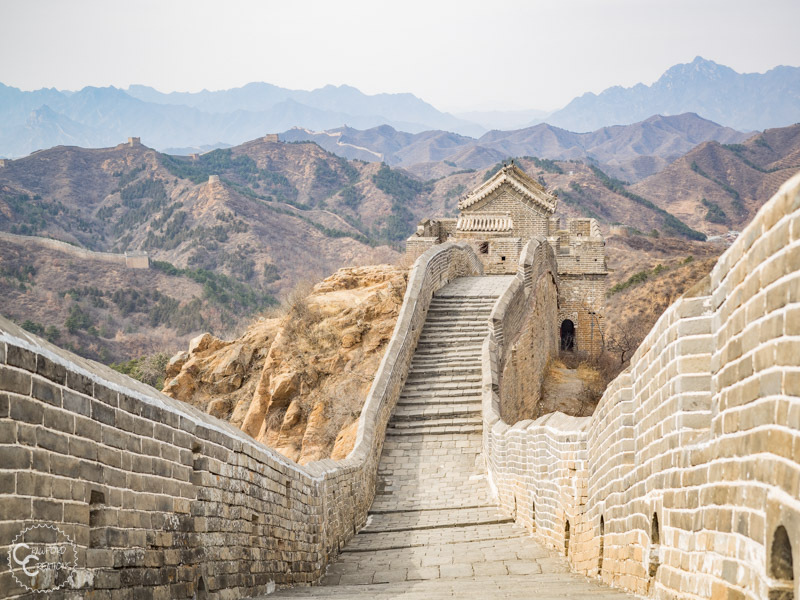 If you’re traveling during this time you can take a direct bus from the Wangjing West Bus Station (outside of the Wanjing West Subway Station) to the Jinshanling Great Wall that leaves every morning at 8:00 am. The bus leaves Jinshanling to return to Beijing at 3:00 pm. The bus costs a mere 32 RMB per person. I’m not sure if this is one way or both, but still, it’s peanuts compared to the cost of a car. The only downside to the bus, besides the fact that it only operates for half the year, is that the schedule is a bit wonky and will change depending on how many people are going that day so it’s best to get someone from your hotel to confirm the schedule for you before you go. 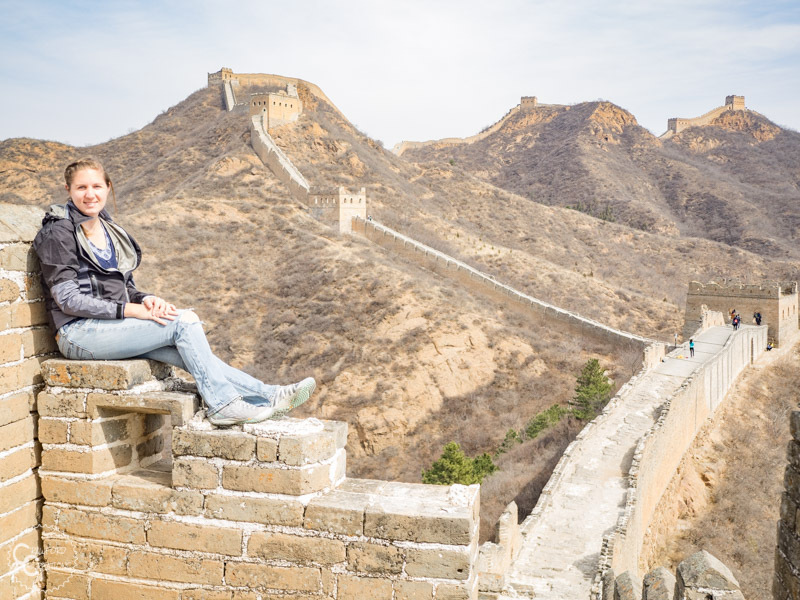 How Much Time Should You Spend At The Jinshanling Great Wall? Budget about 5 hours at the Great Wall. It takes 4 hours to hike the designated long path from the East Five Window Tower to Zhuanduokou Pass (or vice versa), plus another hour to hike up to the wall and back down. Really the only path worth taking, in my opinion of course, is the 6 km route that runs from the East Gate to the West Gate, and vice versa. I mean you drove 2 hours out here to see the Great Wall, so you might as well maximize your time walking on it, right? And when I say this 6 km route takes 4 hours to hike that includes stopping for lots and lots and lots of photos. In essence, I smelled all the roses on this walk, because again, once in a life time Great Wall experience here. If you really want to treat this a proper hike I’m sure you could shave an hour off of that time. But again, I’m not sure why you would want to do that. Unless, of course maybe you’re doing a multiple day hike along the wall. In that case, I’m super jealous. We would love to do that. In the off chance that maybe you’re not feeling well that day or you’re going with some older family members who can’t walk for that long, there are some shorter routes you can take. Start from the East Gate and hike along the wall from East Five Window Tower to Zhuanduokou Pass (located just past the branch of the wall that extends off the main path) and ending at the West Gate/Front Gate (the main gate where the big parking lot and little shopping center is located). Start from the main (front) gate and climb up to the wall at Zhuanduokou Pass. Hike from Zhuanduokou to Houchuankou Pass and take the Jinshan Horse Track back down the mountain to the same gate you started at. Start from the main gate and enter the wall at Zhuanduokou Pass. Hike along the wall to the Small Jinshan Tower where you can take the cable car down the mountain (you will have to pay extra to take the cable car). You really don’t need to bring anything besides food and water. There are a couple stands located in some of the watchtowers, but they’re selling really overpriced drinks and snacks. It’s best to just bring your own supplies and only buy something on the wall if you really get into a bind. We packed a daypack full of water and snacks and that worked out just fine for us until we could reload back at the car at the end of the day. There really isn’t anywhere to get a proper lunch (at least not during the off season when we went) at Jinshanling so be prepared to either pack a lunch or just eat a bunch of snacks to tide you over until you get back to Beijing. You do NOT need your passport to buy tickets to the Great Wall. Even so, I’ve made a habit of bringing it whenever I go to a big tourist attraction in China because you just never know if they’ll ask for it or not. I love this post. The pictures are stunning and, along with your descriptions, makes me want to go there. Guess I’ll have to live vicariously through you! Do u have the driver’s contact? Hi ! Thanks a lot for all your precious informations, this is great !! I just wondered if we could take the cable cal to go up (and not only down), I can’t find the info on any websites, as most people seem to use it to go down. Yes, you can take the cable car to go up as well. Our trip to see the Great Wall was extraordinary. While the drive was a bit long it was worth every minute of it. We were able to see and hike restored sections of the wall and some of the “wild sections” and best of all we could see for miles and there were hardly any people to be seen. Most of my photos had only my party in them even though we could see well over a mile of wall in the frame. I would highly recommend that you spend the time and head out of town and see the Wall in a more remote site. There is a new hotel at the site and I would consider staying there just so you could get an early start hiking the wall. I would have loved to have been on the wall for sunrise and sunset. I totally agree! We had the same experience, there’s not a single other person in the background of our photos. It’s amazing!!! Especially considering how crowded the rest of Beijing was. Such an informative post.Thank you. We are planning to to hike the Jinshanling in September ,but we would like to be there at sunset to take photos .We would take the cable car up , but it looks as though we will have to walk down as the cable car closes 16h30. We would be leaving around 19h30. Would we be able to walk down safely.? .Is it a steep , difficult decent?. Any advice would be much appreciated. The descent isn’t difficult, it’s just steps. I don’t think it’s lit though so maybe just bring a flashlight or use a flashlight app on your phone to get down. Watching the sunset from the wall would be awesome! I hope you have an amazing time! No need for a guide when hiking Jinshanling. There are multiple signs along the route and everything is clearly marked. Hope you guys have a great time! We are going to be there in two weeks (Mid November) We are staying at the hotel near the gate. We want to hike for sunrise and read someone had done it. The opening times posted here show 7:00 am which seems late to capture sunrise. Anyone have experience with this? Also how cold is it in November at the wall. I am assuming we need winter parkas. My understanding is that you have to camp at the campsite inside the scenic area in order make it up to the wall for sunrise. Although, sunrise right now isn’t until 6:50 am, so even staying at the hotel near the entrance, if you take the cable car up you might be able to still catch the end of the sunrise as it’ll be closer to 7 am by the time you go in a couple weeks. Lows are around freezing at night in mid-November so you should definitely bring a winter coat since you’re planning on being up for sunrise. Hope this helps! Hi, thanks for the useful post. I will be there in March. Do you know if I can hire a tourist guide at the entrance of the wall? Or that would need to be done in advance? I didn’t see anywhere at the entrance to hire a guide, but regardless even if there is one the guide would be Chinese speaking only. In order to get an English speaking guide, you would definitely have to arrange one ahead of time. Most hotels in Beijing offer English speaking guide services so that would be a good place to start if you’re looking to find one.